With over 1 billion users worldwide, Facebook has accumulated a lot of information about its users. While the social media giant has constantly battled its users over privacy concerns, we as users should remember that Facebook has only what WE provide to it. This is called user-generated content. From the moment a user registers for a personal Facebook timeline, Facebook has begun to accumulate simple information like first names, surnames, birthdates, and email addresses. Similar to a baby’s first steps, once registered Facebook users begin populating their profiles with in-depth information and personal details. While not a requirement, Facebook allows users to update their profile with favourite movies, graduation dates, wedding announcements, and family members. Furthermore, information about a user is collected when users post status updates, online casino nederlandsegokken upload vacation photos, interact with friends, play games, and “like” Facebook pages of relevancy. Now for the other side of the coin: Information is collected about users when OTHERS share information about you. Do you remember the last time you were tagged in a photo, or checked-in by a friend – that’s all information Facebook knows about the user and his or her friends. Just in case you were curious, there are a few more ways Facebook collects information about you…. Facebook tracks a user’s search queries, including visits to other personal timelines and pages. Remember the last time you uploaded a photo while on a road trip? Facebook recognizes the date, time, and new IP address from which you uploaded your photo. The Facebook platform is a closed-search loop, and is constantly collecting and curating your information for advertisers. With the introduction of Facebook Graph, I suspect Facebook urging users to update and complete their profiles. As a marketer, I appreciate the depth of information that people freely include in their Facebook personal timeline. Personally, my profile is complete, but information is kept to a minimum. To read more about Facebook”s Data Use Policy, click here. The theme of week 3: Reading. Lots. Within the reading, however, I came across three new concepts. Raelin (2008) introduced readers to the idea of tacit knowledge which is “the component of knowledge that is not typically reportable since it is deeply rooted in action and involvement in a specific context” (p. 67). Further, tacit knowledge “represents our skill in doing something, be it mentally or physically” (Raelin, 2008, p. 68). I believe that training should allow the learner to become comfortable and confident with the new skill. Raelin (2008) states “a competent trainer might provide an observable model of tacit skill for the trainee to follow and imitate” (p. 68). This type of knowledge is one that mobile casino I focus on when providing social media training services. I focus on developing the learner’s skill be it creating Facebook Page updates, scheduling tweets using Hootsuite, or updating their LinkedIn profile. Comfort and confidents comes from practice! Within tacit knowledge are two additional modes of learning that follow either theory or practice. In my business I focus on experimentation. Raelin (2008) states “doing should become a trying, and experiment with the world to find out what it is like” (p. 72). A Raelin (2008) highlights, it is important to break down the barriers between theory and practice to allow the “situation at hand to become more natural” (p. 73). Listening and doing are two very different exercises. I also see value in the mode of experience because it “reinforces the tacit knowledge acquired in experimentation (Raelin, 2008, p. 73). This is an important piece of knowledge because “implicit learning is thought to be the foundation for tacit knowledge and can be used to solve problems as well as make reasonable decisions about novel circumstances” (Raelin, 2008, p. 73). Although those three concepts are just snippets of what we covered, I found them extremely valuable. We also worked in our groups to prepare for the looking first assignment deadline. In previous blog posts I’ve covered proper logo use of Facebook and Twitter logos. Everyday, however, I see the logos being used improperly on print media, online websites, and television advertising. As you may know, Pinterest is a relatively new social media platform that has gained a foothold with the female marketplace. These women love planning interior design projects, choosing wedding colours, finding great recipes, and learning about the latest fashions. That said, many other industries are beginning to use Pinterest as a means to promote their products and services. If you are considering integrating Pinterest into your business’ marketing, make sure you educate yourself on their Terms of Service, specifically about logo usage. 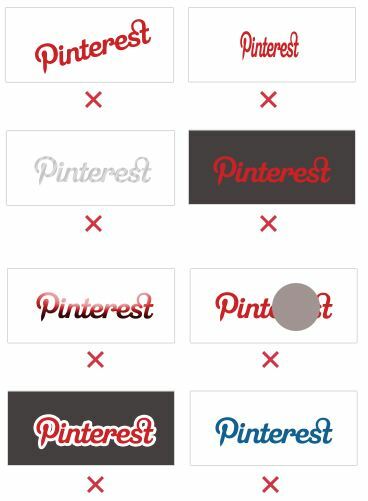 Although it may seem like a good idea at the time, don’t get creative with the Pinterest logo. Here are some examples of what NOT to do! If you still need some guidance, check out their Logo, Trademarks and Marketing Guide for other great information! Have you noticed that some people seem to dominate your Facebook Newsfeed? In the last hour they have uploaded photos from their Caribbean vacation, shared the Grumpy Cat meme, played Jewel Quest thirteen times (and invited you! )… and you just can’t handle it anymore! Facebook allows users to customize WHO and WHAT shows up in their Facebook Newsfeed. Seriously folks, this has been one of the best Facebook features I have discovered. 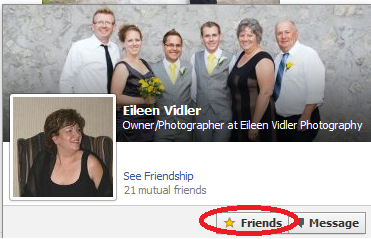 Okay, without naming names, find a Facebook friend who is a little too active on Facebook. We’ll use my mom as the example (Love you mom!). 2. Hover your mouse over their name. A business card-sized box will appear, that includes their profile picture, cover photo, and a few other important details. 3. Hover on the “Friends” button. A drop-down menu of preferences will appear. 4. Click “Settings” under the “Show in Newsfeed.” Note: If you do not want to see ANY update, unclick the “Show in Newsfeed” option. 5. If you still want to receive some updates from your friend, select the updates you want to receive. (Note: This is where you can remove updates about games!) 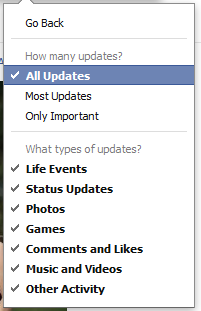 Then select whether or not you wish to receive “All” or “Only Important” updates. 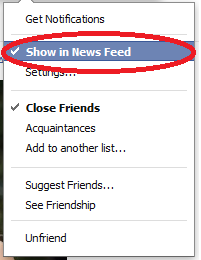 This will help to tailor the updates you receive in your Newsfeed, and keep you from becoming frustrated. Thank-you to Wil Cleland for reminding me that not everyone knows about it yet! Problems equal solutions. This seems to be the theme of the discussions ADED4F34’s week two. The class was asked to read three journal articles, and single chapter, in which all discuss potential problems in the workplace. As a sole proprietor/entrepreneur, this is an interesting topic for me – because I am my only employee. Working in my home office I don’t encounter the latest employee gossip, or witness the inevitable power struggle between managers. On occasion I do witness my budgies fighting for millet, but that’s about all. In my field of work, I have identified that this increase in technology is directly correlated to the increase in workplace anxiety and stress. People have become overwhelmed with the new forms of communication, and are unsure of how to manage these new platforms. The more social networks a company is engaged with, the more touch points there are with customers. And let’s not forget about the classic forms of communication, including emails and cell phones which now many employees “on-call” 24/7. Cruickshank (2008) states 60% of “employees did not receive overtime pay for this work” (p. 55). Furthermore, Cruikshank (2008) states that the “average office worker or white collar worker is interrupted something like 70 times per day – with phone calls or emails or voicemail or beepers or cell phones” (p. 53) In an eight-hour shift that is almost once every 10 minutes. But it’s true, and it has become standard. Workers are expected to do more with less and there extreme pressure from management for employees to do more work in less time. Therefore it is important to put policies in place to ensure that employees understand what is expected of them as the new “social media manager,” for example. What is the expected response time during the week/weekend? What is the policy for overtime? Should there be multiple shifts to cover day/evening monitoring? It is important that employees know what is expected of them from their employer. In turn, this will reduce workplace stress, anxiety and will create a positive and productive environment.